It is reasonable to assume that a certain number of children’s books will feature a dog. Not so much a man’s best friend, as a child’s best friend, dogs have been found to be perfect listeners to books, and cheering companions on adventures. My first dog was Timmy from The Famous Five, but since then they’ve cropped up in all sorts of literature. In this, the Year of the Dog, it seems fitting to bring some new books to your attention in which dogs are more than just a sidekick, they are integral to the story. 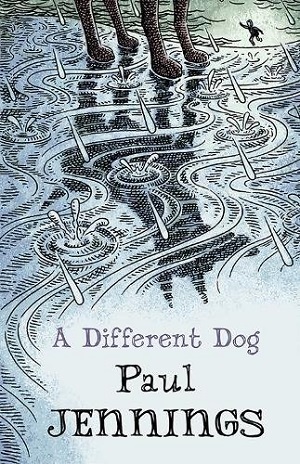 This is a quietly compelling, and with afterthought, immensely powerful tale of a selectively mute boy and his guilt over the dog he forsook. But with a redemptive ending for both himself and a new equally-traumatised dog he stumbles across, as both discover a renewed zest for life. Using extreme economy of words, and writing with intensity and simplicity, Jennings showcases how effective literature can be in few words and without flourish. This is an accomplished text, which draws in reluctant readers and gets across a plethora of not just emotions, but moral dilemmas and extraordinary situations. On a dark day, a nameless boy, poverty-stricken and picked-upon by his peers, aims to complete and win a race up a mountain to win a substantial amount of money for his mother. But when an accident leaves a driver dead, and the driver’s dog alone, the boy finds friendship with the dog, and a solace in the bravery and courage it takes to survive lost on the mountain, and finally, in the denouement, to face up to those who marginalise and bully him. Jennings’s background as a speech pathologist shines through in his dealing with the boy’s selective mutism – he only speaks when alone. But also Jenning’s experience in writing projects itself strongly through the sophisticated text. The reader sympathises immediately with the boy, there is a direct empathy with him, despite and even because of the incident which rendered him temporarily mute, and because the reader is a party to his deepest thoughts and his conversation with the new dog. The economy of writing lends itself to the reluctant readership, but more than that it reflects the character, so that the minimalism feels fully justified and necessary. It’s an intriguing study, in that throughout the challenges facing the boy, and there are many, the reader also feels a slight discomfort – not at the challenges, but about the decisions the boy makes. There is a questioning, a fear of what his mother must be thinking, a moral dilemma at every turn. It comes to the fore in a particularly disturbing scene towards the end of the book, but the consequences bear out what the book is all about – belonging, speaking up for what’s right, finding peace in friendships, and how sometimes the strongest communication is that without words. There’s a resounding line in the book about relationships: “You’re heavy, not a burden” his mother says to the son, and he repeats this to the new dog, but there is much more to think about here: love, guilt, courage, resilience, persistence, bullying, treatment of animals. For a reluctant teen audience, yet accessible for 10+ years, this is a story that is muted in tone, quiet but astonishingly powerful. I read a proof copy, but the illustrations so far are deliciously obscure too – wooded areas, dark shadows, heavy lines. They emphasise the point – the woods may be deep and dark, but there’s a path out, and the experience may effect wondrous changes in thought and deeds. You can buy it here. Much lighter fare in this quirky story for middle grade readers, which suggested a sort of European Ramona the Brave. Elise lives in Copenhagen, but her mother is away building bridges in the Amazon, and her father plays the violin outside the local department store. 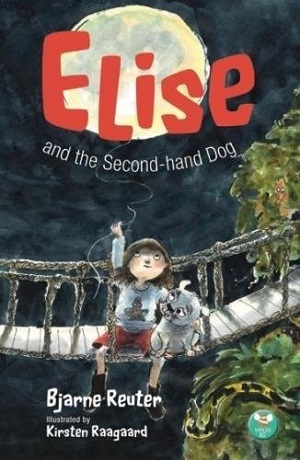 Elise misses her mother terribly and finally persuades her father to buy her a dog (although it has to be second-hand for they don’t have much money). The dog she ends up with is not a cute and fluffy pet, but rotund with bowlegged limbs and a whiffy smell. However, she soon realises that her dog can talk. Together, then go on a series of adventures, from building their own suspense bridge across the Amazon in her bedroom to hunting vampires in Elise’s grandma’s old mill. The dog, of course, only makes his talent known to Elise, and he’s as quirky as she, explaining that he’s from Tobermory in Scotland, speaking Danish with a Scottish accent and proving knowledgeable about whiskey. But the book is more than a sum of its parts – what makes it so special is the community that surrounds Elise and her dog. Each character has something to add to the story, and enhances the warmth that surrounds Elise like a loving hug. The cast is diverse and different, each with their own foibles and quirks, but all with good intentions. The interest also lies in the surroundings being removed from the familiar – not in that the book is Danish as such, but that Reuter doesn’t hold back from mentioning names of lesser well-known composers, as well as exploring life’s adult complexities – alcohol and its effects, the concept of possibly dangerous strangers walking round the town after dark. Elise is innocent, but far less mollycoddled than some in English children’s literature, and she’s all the better for it. There’s a sense of humour that pervades the whole, and a certainty that there’s nothing more important than having imagination. The book has oodles of it, and is charming, witty and smart. Just like Elise’s talking dog, it speaks to children everywhere. You can buy it here. This wonderfully illustrated, full colour poetry book is amazingly a first outing for Eloise Greenfield in the UK, despite her having published 47 books for children and having won awards for some of them in her native USA. 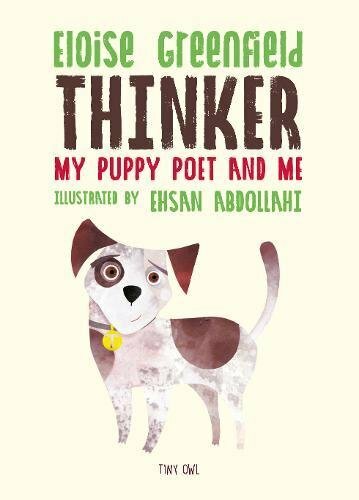 Thinker, My Puppy Poet and Me is a collection of poems for young children, taking the premise that Thinker, the dog, is a poet, along with his owner, Jace, and together they explore the world around them using free verse. From the magical illustration on the endpapers, in which Abdollahi portrays Thinker as a carefree happy puppy enveloped by floating flowers, and seemingly following the scent of an exquisite colourful bird, the book explores the wonders and mysteries of the world. The first poem describes Thinker’s arrival in Jace’s house, and his feeling of love and belonging. Before long they are exploring the magic of language, the learning they still have to do (Jace is only seven, after all), and the conundrums of school, all in a gentle cohesive narrative. The text and illustrations are populated by a truly special group of people, from siblings and neighbours to friends and even a stranger in the park, but there’s a feeling of community that builds throughout. This is a wonderful introduction to poetry, including some haiku, free verse, rap and rhyme, and each poem pulsates with the rhythm of language and life. The poems can be read for pure enjoyment, or to study the shape, repetition, language and rhythm. You can buy your own copy here. 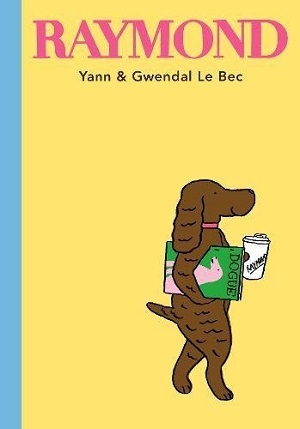 A tongue-in-cheek book that toys frantically with doggie word play. Raymond is an ordinary dog until the day he has a big thought about the place of a dog within a family. Before long, he has completely anthropomorphised, and becomes a journalist, or a ‘rover’ing’ reporter at Dogue magazine. Along with the other dogs in town, he sees things differently on two legs. He enjoys cappuccinos and the cinema; at work he sniffs out deadlines. But a chance encounter with a ball makes him see that things aren’t always that great for humans. It brings a whole new meaning to the phrase, ‘working himself to the bone’, and sets out to explore that a dog’s life is a great life after all. In bold bright colours, the detailed illustrations provide a great take on modern life, and promote the message that working too hard without seeing the pleasures of the everyday is a bad thing. Children and adults will chuckle at the two-legged life of all these urban dogs, despite the message being less than subtle. The cartoon-digital feel of the book lends itself well to the glamorous lifestyle of a glossy magazine. A fun book to spark debate about having it all, and all-too-fast modern living. Lead your doggy life here. ← What’s the Big Idea?